Sarah Novacek is building a multi-million dollar logistics business from humble beginnings. As the newlywed wife of a kid from a truck-driving family, she was just trying to help her husband find loads and get paid. Her “ah-ha” moment was wondering, “How do truckers do this who don’t have a wife or girlfriend?” That thought led to offering her services to other independent truckers. Sarah had wanted to own her own business since college introduced her to a bigger vision of opportunity. Her new husband and father-in-law were both small business owners, but she immediately saw the limits of their independent trucking business. There was no good way to grow the business; it was capital-intensive because of the expense of the trucks, and it was labor-limited because there are only so many hours in a day that drivers are allowed to operate trucks. It required active management of cash flow with high fuel expenses that was complicated by the time delay between when a load is delivered and when shipping clients pay. Somebody had to first acquire a load, then do the follow-up paperwork to prove timely delivery and get paid by the shipper. If that somebody was driving a truck full-time, the office work tended to suffer. Sarah’s husband, Brian, had grown up in the front lines of the transportation logistics industry. He had hard experience in driving, accounting, payroll, dispatching, collections and more. He’d dealt with problematic shippers, receivers and drivers and knew the excuses. While Brian knew the drivers, Sarah learned the logistics business facing the shippers as her key customers. Drivers are necessary but not sufficient; if there were no loads from the shippers then there was nothing for drivers to do. Shippers were the indispensable relationship. Sarah soon learned how to cultivate, acquire and sustain relationships with profitable shippers. Flash forward ten years. Sarah has gone from being an adjunct of her in-law’s trucking business, to a solo broker operating out of an in-home basement office, to the owner of a corporation with more than $2.5 million in annual revenues that serves national brand name food companies like Jennie-O, Hormel, Michael Foods and more. More than 100 percent revenue growth. Transition from a “doing business as” structure to a new corporate entity, in order to accommodate future growth. Moving the company’s office into professional office space within the North Iowa Area John Pappajohn Business Incubator. The changes and growth of the last eighteen months are a direct result of Sarah’s coaching from North Iowa Area SBDC counselors Brook Boehmler and Daniel Winegarden. Legacy Logistics Freight has never lost a corporate client and continues to add clients and new volume from existing clients. Combine this with the overall revenue growth and profitability and it’s a significant measure of customer satisfaction. Sarah opened her business in 2006 with a Fortune 100 food company shipper as her first client. She began brokering loads for Jennie-O turkeys to multiple trucking companies and not just ABC Trucking. Legacy Logistics Freight rapidly grew into a multi-million dollar business in just a few short years. Gross income in 2006 was almost two hundred thousand dollars. In 2014, the company grossed over two million dollars. The company has grown almost 14 times larger in just seven years and now has multiple national food company clients. Sarah strategically grew the company right through the recent recession by focusing on food company clients. “People have to eat,” Sarah explains. Sarah says that ambition counts for a lot. She and Brian agreed when they were first married that they each wanted their own business that would let them do what they do well. Controlling their own time was also a motivator in their five year plan. Sarah suggested that they didn’t have to own the trucks, so long as they controlled the shipper relationship; they could place the loads and fulfill the contracts by brokering loads to other drivers. On the advice of the SBDC, Legacy Logistics Freight incorporated in 2015 because the scale of the business grew and Sarah had more need of a liability firewall between her business and personal assets. Sarah is responsible for leadership and management, especially obtaining, growing, and keeping shippers, the lifeblood of the company. Brian’s mother, Mary Novacek, is the Controller. She can also help with dispatching and customer service and is Sarah’s back-up. The company is 100 percent female-owned and managed. Another area the SBDC assisted Legacy Logistics Freight was in guiding Sarah to register her company as a Targeted Small Business (TSB). Many government procurement contracts require a set aside for some share of the contract spending to go through targeted small businesses and TSB status is a point of service differentiation and competitive advantage in a male-ownership-dominated industry. This is one of Sarah’s growth strategies going forward, as many of her current customers do business with federal and state governments. Legacy Logistics Freight outgrew its humble home business setting. In 2015 Sarah moved her business office into the John Pappajohn Business Incubator, a co-working space operated by Sarah’s alma mater, North Iowa Area Community College (NIACC) and its John Pappajohn Entrepreneurial Center. The incubator provides both a professional working environment and easily available business coaching assistance from the SBDC. Sarah is a great example of a true entrepreneur who saw a specific need and started a business to fulfill that need. 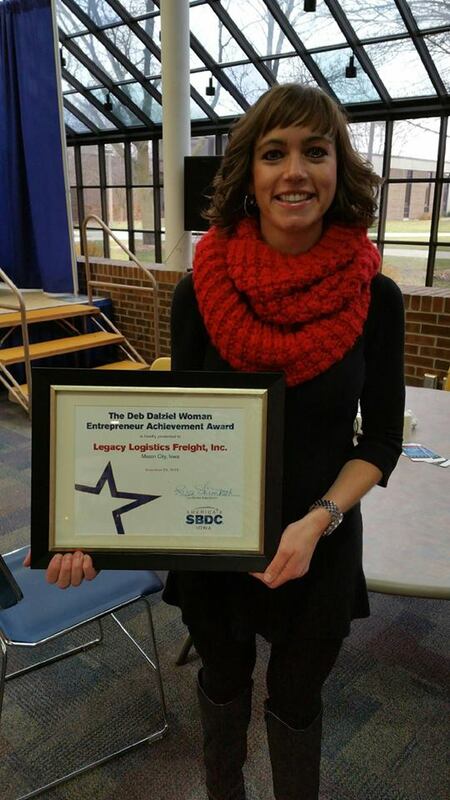 For more information on her Mason City, Iowa business, visit www.legacylogisticsfreight.com or the company’s Facebook page here.